Leonie was an inspiration to our school. She brought knowledge, enthusiasm, colour and excitement to everyone involved in the building, planting and harvesting of our garden. 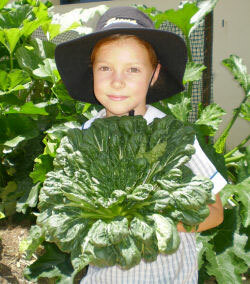 We never dreamed a herb and vege garden could be so much fun for students, parents and staff. Our edible garden was a roaring success and the Culminating Day was a feast that parents will talk about for years to come. On a curriculum level, Leonie provided us with a year-round working document that money just can't buy. What she knows about school gardens, plant selection and how to build, implement, rotate, fertilize and enrich garden sites cannot be found in any book. It shouldn't have been a surprise but the way the students took to the whole "getting dirty" idea was so uplifting for staff and parents alike. Those who so often struggled in the classroom were, without doubt, the leaders in the garden. They were fearless, leading by example. It really changed the dynamics of our class and ended our school year on such a high for all involved. More than half of the students built similar gardens at home over the Christmas holidays. This Permaculture garden project has started our school thinking and talking about some of the greater issues the world faces today. Minds at Siena, both young and old, are starting to look at our future just a little differently.